Vivian Maeda – Slow Food Scotland – Chef Alliance Coordinator stops by at Glenapp Castle and enjoys a Slow coffee break with Chef David Alexander. Q: Chef David, tell me, you have worked in this industry for many years, what are the food trends for Scotland? A: Possibly not trends but Provenance and Seasonality are both important to me. 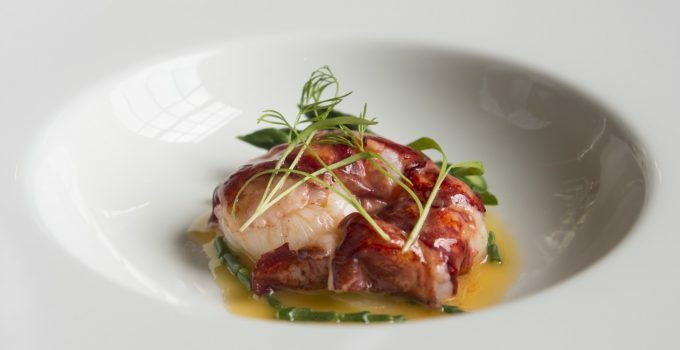 Q: Wow, chef, the butter poached Ballantrae lobster with pink grapefruit and fennel looks and smells delicious! Ok, exploring your cooking now, tell me what influences your cooking and the creation of new dishes? A: Inspiration starts with great quality produce from our suppliers or our own garden. Q: Good stuff, so what is the latest Ark of Taste product you are using at the moment and why. Q: What does it mean working with local artisan producers for you? A: Working with local producers allows us to showcase what this area has to offer from lamb to lobster and everything in between. Q: I am enjoying the chat, chef, but I suppose time is up, so last one for our readers. Ok, Chef David: Imagine you are having dinner with Carlo Petrini what is the one question you would ask him? Thank you for the coffee and the chat, chef. Your values and passion for food are certainly inspiring for many chefs, I am sure. Great to have you as a member of the Slow Food Chef Alliance. Better head off, nice catching up with you!